"Choose your side. Kingdoms will fall." 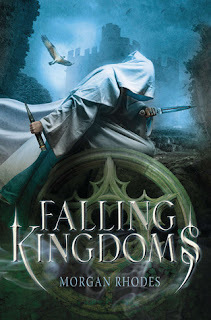 Falling Kingdoms falls under an unfamiliar genre to me, unlike anything I've read before - it was fresh and I loved it. My comfort zone, genre-wise, lies with dystopian novels but I was determined to give Falling Kingdoms a go as it fitted all criteria when I searched for a novel based on my love for programmes such as Pillars Of The Earth, World Without End and Merlin. I can honestly say that I wasn't disappointed, quite the opposite actually. Falling Kingdoms is a story built around the solidity of 3 Kingdoms but is mainly the workmanship of the characters - each strong and distinct - as well as their varying beliefs. As a whole, I'm not a fan of 3rd person (which this novel is written in) but I was so absorbed in this enthralling story that I hardly noticed it at all. Another concern I had, which this book quickly overcame, was that I would become overwhelmed and confused with the load of characters. This certainly was not a problem; after being a few chapters in you know who is who and what they do like the back of your hand - BUT if any confusion does arise, there's a handy cast list and map for all 3 kingdoms located at the start of the novel. The narrative (though in 3rd person) flips between the 3 kingdoms, following the perspectives of differing characters (mainly those of the princess, rebel and sorceress mentioned in the blurb). I found myself enjoying every element and perspective of this novel, never once was I bored or wishing for the plot to hurry on. Rhodes created an outstanding world - one so vivid in my imagination with an array of strong-headed and unique characters. The plot never failed to keep you engaged. I surprisingly loves this book and would definitely recommend it. I can't wait for the sequel. OOh nice review! I still need to read this one but it sounds fabulous!